Finally! LED lamps made it to the Midwest after a year or more on the left and right coast. And what a low price! Not only do they put out as much light as those high powered LED flashlights that have been on the market recently, but they cost half as much. 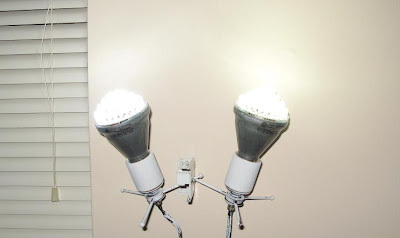 A pair of LED light "bulbs" sell for under $15 at Sam's Club, use only 3.5 watts of electricity, yet put out as much light as a 45 watt incandescent bulb, which typically is the same as an 11 watt CFL (compact fluorescent light), those spirals or hoops that have been around for a decade now. Let's compare costs of an LED lamp, a CFL lamp and a traditional incandescent light bulb. The national average for electricity was 11.59 cents per kilowatt hour as of April 2009. Dayton, Power and Light charged that, give and take a tenth of a penny, on my last two bills. The lamp retail prices are also from the Dayton area, but varies depending on where you shop. If you are following along with your calculator, multiply watts by hours (in this case, 30,000), then divide by 1000 to get your energy in kilowatt-hours. Multiply by 0.11 to get dollars. Then add the purchase price of the many bulbs you'll use (or just the one LED fixture), and you're done. It's faster to simply multiply watts by 30, skipping the division by 1000. Using a 30,000 hour lifespan for the LED fixture, a 10,000 hour lifespan for the CFL, and a 1,000 hour lifespan for the incandescent, let's see the total cost for 30,000 hours of light from each product. Especially noteworthy is that all the energy used by a light ends up as heat. In Summer any light source will cost you double, plus the added cost of the inefficiency of the A/C. However, in Winter, lights will reduce the burden on your furnace, and the energy costs can be ignored. For Daytonians, I'm assuming you run the furnace about 6 months and run the A/C about 6 months, thereby canceling out each other's costs. With that in mind, incandescent lighting will cost $144 more than fluorescent, and fluorescent costs almost $32 more than LED lighting. Now multiply that by the number of fixtures in the home, and you'll have the dollar savings over a long period. How long? If you run each fixture 8 hours a day, the 30,000 hours lasts over 10 years. So, for a home with 10 fixtures, you'll save $144 a year, and $1,440 in 10 years. How about for non-Daytonians? Hawaii costs over 22 cents per kilowatt-hour, Connecticut over 20 cents, New York and Massachusetts between 17 and 18 cents, and many states cost between 15 and 17 cents. But the three cheapest states, Idaho, North Dakota and Washington, fall between 7 and 8 cents. DP&L charged 8 cents only a few years back, so we see prices are rising fast. Let's try the third cheapest state, Washington, at 7.7 cents. Also, bear in mind that in some parts of the state you never run the A/C, such as the west coast. In fact, they don't even have an A/C in their homes. This year's 105 degree anomoly aside, the already low cost for lighting will add desired heat to their homes, and so will not incur extra costs to cool the home. So, in a state as cheap as Washington, the LED saves you over $100 per fixture if you use incandescent, and over $25 if you use fluorescent. In fact, in states such as these, and in parts of Canada, let's see what happens if you have a 9 month "Winter" during which you run the furnace. Assuming you don't run the A/C, here are the price savings ignoring 9/12ths of the energy costs. In these places LED lighting only costs about $31 less than incandescent, and $12 less than fluorescent. Comparing 10 incandescent to 10 LED's, the savings vary dramatically depending on where you live: about $3,000 in hot climates, about $1,440 in Dayton, and as little as $310 in the cold climates. Comparing 10 LED's to 10 CFL's, the savings vary from $900 in hot climates, $320 in Dayton and only $120 in cold climates. However, a large factor must be considered. LED lights traditionally have a lifespan of 100,000 hours, not 30,000. And the CFL's you buy often only live 3,000 hours, not the full 10,000 or 11,000 advertised lifespan. In fact, many CFL's are now advertised as only having a 5000 hour lifespan. Let's see how costs vary if we compare a 100,000 hour LED to a 3,000 hour CFL to a 1000 hour incandescent. In a best case scenario, an LED light costs $240 less than a CFL, and about $500 less than an incandescent. It's amazing that 50 cent light bulb costs so much. On the other hand, a 100,000 hour LED burning 8 hours a day will last 34 years. By the time it burns out, inflation will generally increase costs, CFL's and incandescents may not even be on the market anymore. Current LED technology will be replaced by cheaper organic LED's not made from heavy metals. Energy costs will probably be double what they are now, we'll all be driving electric cars to save money, and you won't be able to remember the names of your brother's kids. But in the meantime, LED's are cool! LED light bulbs could very well be the next best thing in lighting. The technology is making inroads in every market, with an LED bulb for any application. It reminds me of how compact fluorescent technology slowly dominated incandescent technology. There is a similar roadblock, as well; LEDs have outlandish high prices. LEDs have a long list of advantages over incandescent and CFL lighting. A common complaint about compact fluorescents is the ramp-up time to full brightness. Instant-on CFLs provide light instantly, but still require time to reach full brightness. LED light bulbs provide full illumination from the moment they’re turned on. Led lights are the one for me the cheapest and and the safest to used in house improvement, the lights is really cool, not so hurt with the eye, so no wonder why Led lights now are in demand.